On occasion I get offered some fun products to try. I had the opportunity to try this local company, Briyo Ceylon. I had never even heard of them, so I was excited to not only try them, but to have the opportunity to support a local business. The tea came beautifully wrapped, which was a nice touch. I prefer black tea. A nice solid black tea. Mostly because I love tea in the morning with my breakfast, so I don’t want a lot going on. Lucky for me they surprised me with English Breakfast tea. It was perfect. A nice solid blend and no bitter after taste. I am pretty picky about my teas, and I was pleasantly surprised by this one. They also sent a lemon green tea that my daughter just loved. Briyo Ceylon sources only the highest quality tea, providing an unmatched flavor experience. Our 100% pure Ceylon tea comes from environmentally sustainable estates located in Sri Lanka, a small island country located off the southern tip of India. This handpicked tea ensures only the tender top leaves are harvested to provide the best quality tea. Sri Lanka’s geographical location makes it unique for tea growing production because of its high altitudes, abundant precipitation, and lots of sunshine. With your first sip you will recognize you are drinking a tea of the highest quality. Now it’s your turn to try out this tea. All you need to do is go to their website, check out the flavors of tea and let me know what 2 flavors would you like to try. You know why I want to you answer that question? Because if I choose you, those will be the 2 boxes of tea you will receive. Don’t keep this to yourself. Let’s get the word out about this company. Share this on your Facebook page, let me know you did and I will add an additionally entry for you. Don’t want to wait to win some? Then you need to know that they have free shipping. Order some today. Giveaway will end on Monday, February 17th at noon. Winner will be announced later that day. This giveaway is now closed. The winner is Suzanne H.
Why so many giveaways? Well, I am celebrating my birthday month with you. Giveaways all month long, so keep checking back. I want to try the Lemon Green Tea & Raspberry Black Tea. Earl Grey Black & Green Tea for me, thx so much!! I am entering on behalf of my husband who enjoys tea…..for him I would choose the English Breakfast and Lemon Green teas. I also shared on FB! I would definitely like to try the English Breakfast and the Lemon Green Tea! This tea looks great! I would try the Lemon Green Tea and English Breakfast Black Tea. I would choose the Raspberry Black Tea and the Lemon Green Tea. The raspberry one would be great on ice! Earl Grey and Lemon Green Tea!! I’m pretty picky about my tea… curious to try it! Yummm… Earl Grey and Lemon Green all the way! 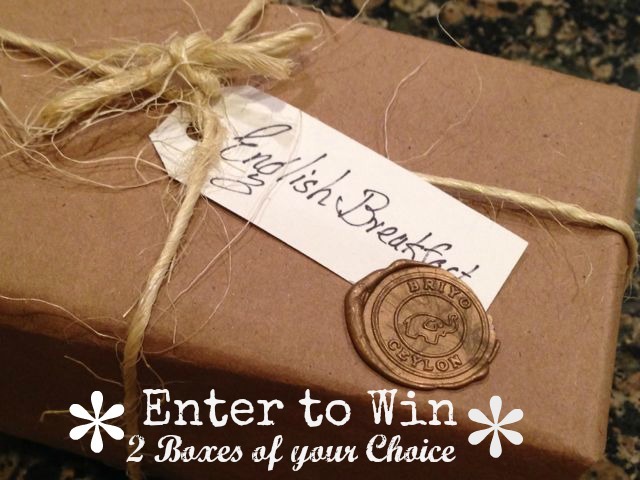 I’d try my two favorites…Earl Grey and English Breakfast. I haven’t heard of this company either. I love tea! I’d choose English Breakfast and Earl Grey. My favorites. I would love to try the Black tea, and the green tea, and would love to win for my husband since he drinks tea every day! I love tea! I would love to try the Briyo Ceylon Earl Grey Black and the Lemon Green Tea Varieties. I will share this link on my Facebook page. I hadn’t heard of Briyo before, either. I love that Portland is the home to so many great foods and potables! Yum – I’d go for the Earl grey and the English breakfast.